<img src="/sites/datacenterknowledge.com/files/wp-content/uploads/2011/02/mobile-traffic-growth.jpg" alt="" width="470" height="394" /> Analysts expect incredible growth in mobile data traffic in coming years. What will this mean for mobile network providers, their networks and their pricing? Smartphones represent only 13% of total global handsets – but 78% of total handset traffic. In 2010, 3 million tablets were connected to the mobile network, each generating 5 times more traffic than the average smartphone. The iPhone and Android platforms generate most of the smartphone data use. 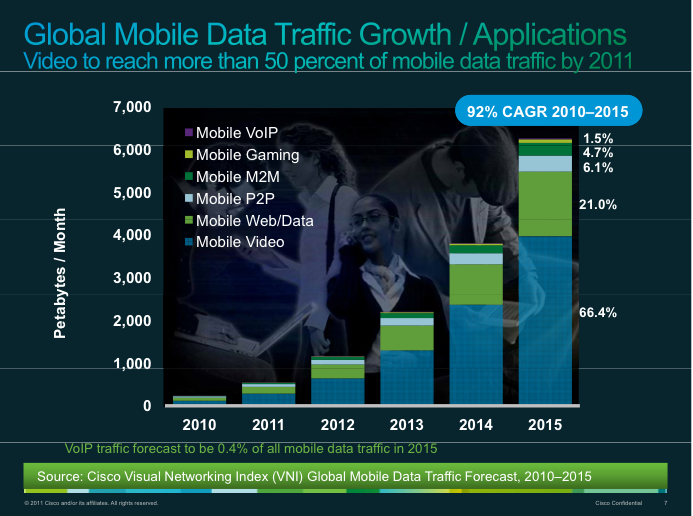 Mobile data traffic will increase 26-fold between 2010 and 2015. Two-thirds of the world‘s mobile data traffic will be video by 2015. There will be 788 million mobile-only Internet users by 2015. These certainly are impressive figures and expectations and, in fact, have caused a lot of discussion on many news sites and blogs in recent days. In context, this means that mobile data traffic will grow from 0.24 Exabytes in 2010 to 6.3 Exabytes in 2015, or just over 6 million Terabytes. Not surprisingly, mobile video will generate the majority of the data growth, as illustrated in the figure below. The second largest segment is mobile Web/Data. These two sources will be responsible for almost 90% of the total mobile data traffic. How will mobile networks be impacted? None of this is surprising in itself, except for the amount of data growth forecasted. The penetration of powerful smartphones and tablets will increase exponentially, resulting in more mobile data consumption. Although a great deal of the data will be offloaded to fixed networks by devices’ dual-mode feature, e.g. via Wi-Fi, the traffic growth on mobile networks in still impressive to say the least. Mobile Network Operators (MNOs) will be severely challenged to provide the needed capacity expansion in their network – otherwise the data traffic will simply clog their networks. As a result, there's a strong chance that MNOs will also need to revamp their current subscription packages or price plans. Certainly, to support the data growth, the forecast assumes a considerable augmentation in mobile broadband networks, especially through 4G with LTE (Long Term Evolution) that, theoretically, supports 100Mbps downlink and 50Mbps uplink speeds in optimal surroundings. However, according to other forecasts, LTE will only account for about 4% of global mobile connections, so it seems somewhat contradicting that MNOs can actually support the extreme growth predictions in their current 2G/3G networks, simply due to technological restraints. In any sense, it casts doubts on their capacity to handle this type of growth expectations. MNOs data subscription packages will need to change from the current ones. MNOs know that revenues will proportionally not keep up with increased data traffic, and therefore have to come up with other alternatives. According to an ABI Research paper, data revenues will only grow at a Compound Annual Growth Rate (CAGR) of about 15 to 18 percent until 2015, while data traffic is expected to have a 42 percent CAGR rate. Certainly, "unlimited" data packages will be endangered – although these packages normally have actual limits. Other types of price plans, such as congestion pricing, tiered and metered pricing seem to be a likely alternative, although it is still premature to know in any detail. From the perspective of mobile cloud computing, this is imperative. Users will always be sensitive to unexpected or unreasonable charges for data traffic exceeding their monthly limits. They are unlikely to accept the current MNO pricing plans that don't seem to support or be favorable to the expected growth in data traffic. It will be fascinating to follow both how the mobile cloud will proliferate and how MNOs will adapt.